I'm so into perfecting my brows at the minute, it's strange really because I used to hate doing my brows and would rarely do anything with them but now I find it so satisfying getting them perfect and on point, no makeup look is complete without a pair of gorgeous brows after all is it. 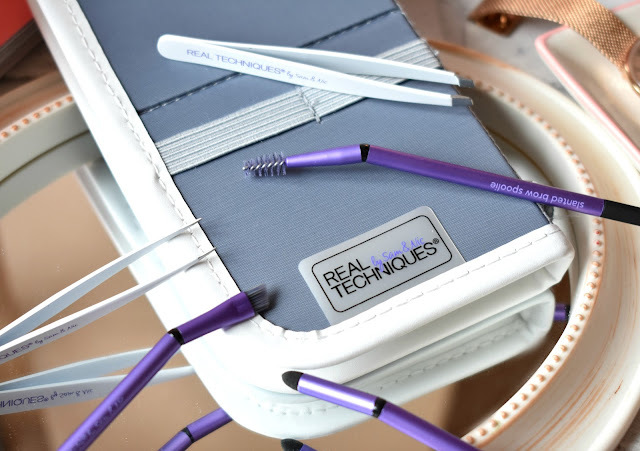 In order to get my brows on point I've been using my Real Techniques Brow Set which contains all the tools you need to get the best brows in town! The Real Techniques Brow Set features a pair of Angled Tweezers which are stainless steel with an angled tip for overall shaping, Detailing Tweezers which again are stainless steel with a pointed tip to catch fine hairs, a Brow Spoolie perfectly sized for brow grooming and shaping, a Slanted Arch Definer which allows you to plot your perfect brow shape and then the all important Slanted Brow Brush for applying your brow products to fill and define those brows! 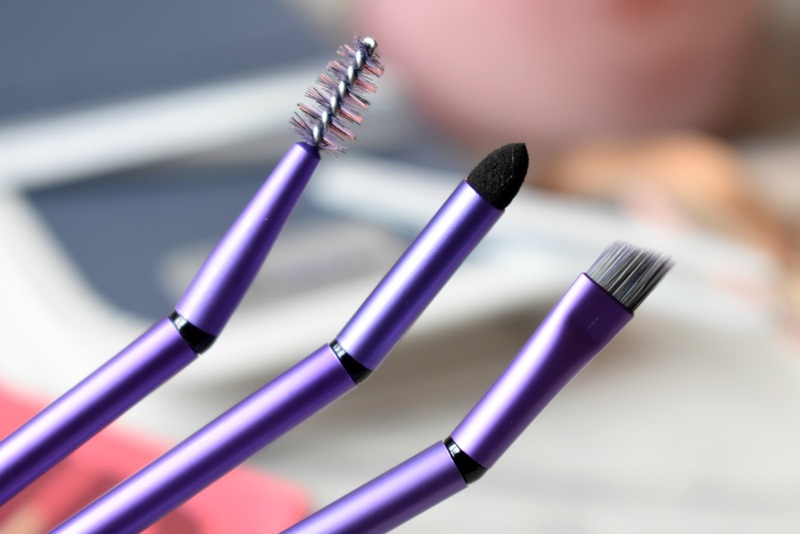 The set comes complete with a panoramic case which you can use to keep your brushes organised at home or on the go, and you can pop your brushes in it upside down after washing too so they dry out properly, it's really handy! 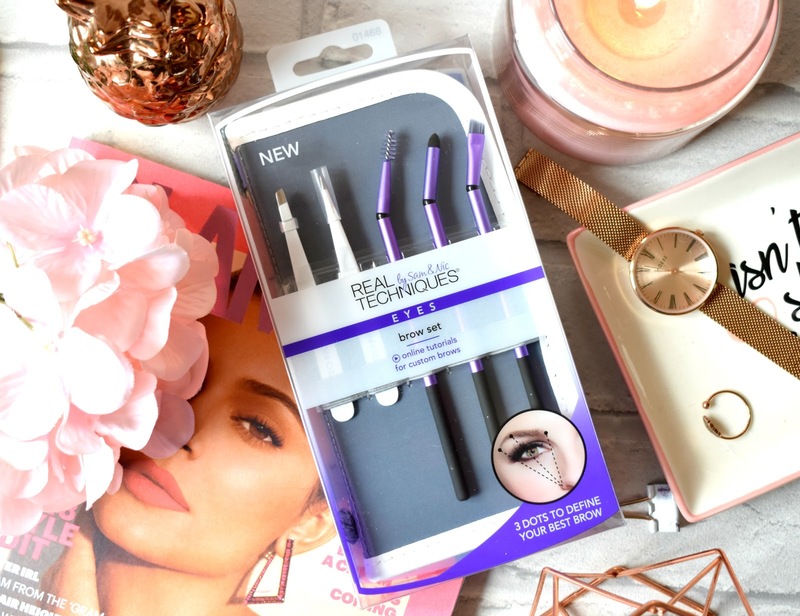 I find everything in this set super useful apart from one thing which I'll get onto in a moment...However both pairs of tweezers feel really well made and are super sharp and get every brow hair, I'm talking even the smallest of hairs! I use the brow spoolie everyday to brush through my brows before and after filling them in, it gives such a natural, fluffy effect to my brows which I love and to be honest I couldn't live without my little spoolie now! The slanted brow brush is the perfect size and shape for any brows and can used with powders, creams, liquids and even brow wax and is super precise! Then finally we have the slanted arch definer which personally I think is a pretty pointless item to have in this set, yes it allows you to plot in the perfect brow shape from the beginning, the arch and the tail but you can literally use any makeup brush or even a pencil to rest on your face to do this, even if your a complete beginner you would still have something in your makeup brush collection that you could use to plot out your brows! I do however love how each brush has a special 159 degree angle which means they never get in the way of your vision as you are using them. Brilliant! 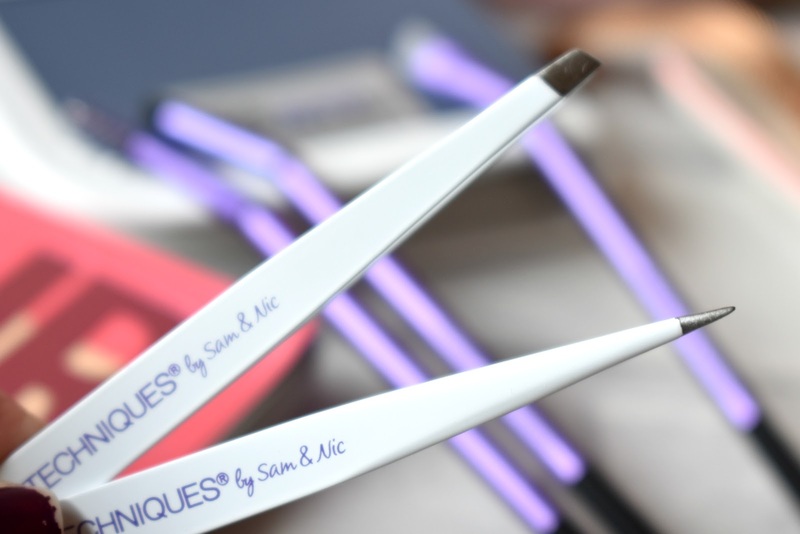 Overall I think whether your new or a pro at brows this set really does come in handy, the tweezers are great and I had actually been after some good quality tweezers for a while and these certainly cut the mustard and the brow brush and spoolie work a treat! You can find the Real Techniques Brow Set for £7.79 HERE.